Cove's Martin Scott Picture by Colin Rennie. Scott was let go after dropping out of the Blue Brazil’s plans and was immediately snapped up by the Highland League leaders. He made his debut in Saturday’s 3-1 Highland League Cup semi-final victory over Wick Academy at Balmoral Stadium. The recruitment of Scott by Cove, whose honorary club president Alan McRae is also the president of the SFA, has angered League Two teams as it has again highlighted that they are playing to different rules ahead of the end-of-season pyramid play-offs. Scott could not join any senior side as he was not a free agent at the end of January. However, he was able to join the Highland League outfit as their transfer window remains open for all types of deals until the end of March. A similar situation exists in the Lowland League. League Two sides are now set to make a joint complaint. A spokesperson, who did not wish to be named, said: “It is unfair that teams are operating to different rules ahead of a play-off final to decide a much sought-after senior place. “Highland League and Lowland League sides have access to players much longer than a senior club does. “They can strengthen their squad while a senior club cannot and that is fundamentally unfair. “If we are in a pyramid, then we should be playing by the same rules. 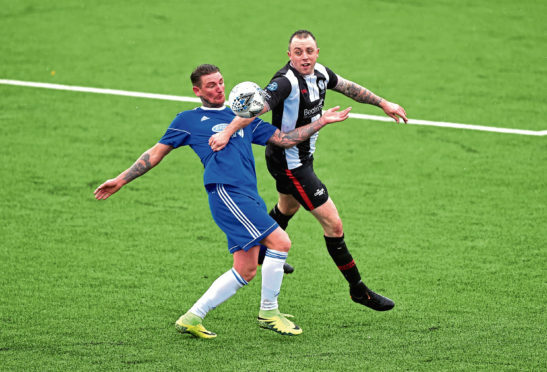 “Last season Cove knew the league was won in March and they brought in a good number of new players ahead of facing Spartans in the play-off semi-final. “These moves not only strengthened their squad, but allowed them to rest players as well. “They got through to face Cowdenbeath in a better shape than they would have been had they had to stick to the January transfer window. “Cowdenbeath won and the matter died down, but this move has highlighted it again. The 33-year-old Scott started his career at Livingston and had a further two spells with the Lions as well as playing for Ross County, Hibs, Raith Rovers and Arbroath. He also had a stint in India with Salgaocar before joining the Blue Brazil in the summer.